Borgward Group AG is continuing to pursue its growth strategy with the sales launch of the Borgward BX5 in China. Featuring a length of 4.48 meters and a wheelbase of 2.68 meters, the new vehicle went on sale in today’s fastest growing SUV segment. The Borgward BX5, which comes with a fully variable torque-on-demand all-wheel drive as an option, combines the virtues of classic SUVs (e.g. great versatility and superior comfort) with an unparalleled amount of space for a vehicle of this class as well as with the brand’s typically comprehensive range of online infotainment. 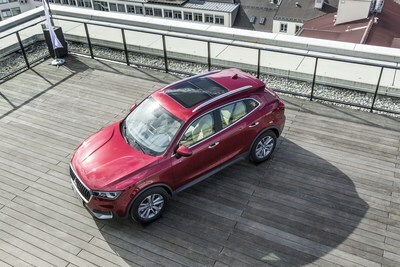 “The new Borgward BX5 will provide crucial momentum to the growth of our brand. Our customers will be thrilled by the vehicle’s impressive level of quality, outstanding appointments, and comprehensive range of services and warranties as well as by its attractive pricing,” said Ulrich Walker, CEO of Borgward Group AG, at the sales launch in the Chinese capital of Beijing. The BX5 features the company’s distinctive design DNA, including the OCTAGON radiator grille bearing the legendary diamond-shape brand logo, the typical wing lines along the sides, and the conspicuous Borgward lettering at the rear. This design philosophy is seamlessly reiterated by the wing line elements in the interior, which is dominated by high-quality materials. This impression is further enhanced by the outstanding craftsmanship and the ergonomic design of all the controls. Thanks to its B-Link Smart Connectivity System, the BX5 also adheres to the BORGWARD brand philosophy with respect to networking. The connectivity system is intuitively operable and thoroughly networked as a result of its Internet access. It also offers a comprehensive range of online services and comes with a centrally located 8-inch touchscreen. Customers can choose between six different equipment lines and configure the BX5 according to their individual needs. In addition to the basic versions Manual Modern Style and Modern Style, which already feature an extensive range of equipment, the higher quality equipment lines Fashion Style, Energetic Style, Smart Style, and Premium Style include details such as a full leather interior, a large glass roof and keyless access, which are found in higher-level vehicle classes. To supplement these features, Borgward is the first German automaker to offer attractive and affordable service and warranty packages on the Chinese market. As was already the case with the debut model, the BX7, customers can purchase an extended warranty, for example, or a comprehensive, all-in-one repair and service package that is valid for the entire lifetime of the vehicle. The all-round intelligent occupant-safety concept PROTECT guarantees exceptional safety for driver and passengers in the Borgward BX5. Here, groundbreaking dynamic handling and driver assistance systems help to prevent collisions. If, however, the worst comes to the worst, passive restraint systems and a very strong passenger compartment with precisely defined deformation zones provide reliable protection and can significantly moderate the consequences of an accident for vehicle occupants. As such, the BX5 fulfils the essential conditions for passing all international crash tests. On the Chinese market, the vehicle is powered by a supercharged, direct-injection gasoline engine with an output of 140 kW (190 hp). It guarantees an appealing driving performance and features CO2 emission and fuel consumption values that are typical for vehicles of this class. The BX5 is scheduled to be launched in Europe in 2019, when the vehicle will also be available with a pioneering electric drive system.